Apparently meatloaf muffins are going to be a recurring theme on this blog, which makes sense considering I make some incarnation of these meatloaves almost weekly. In this third meatloaf muffin post, I’m going back to the ground chicken, but have added some new flavors…specifically by substituting crushed cheese crackers for the bread crumbs. 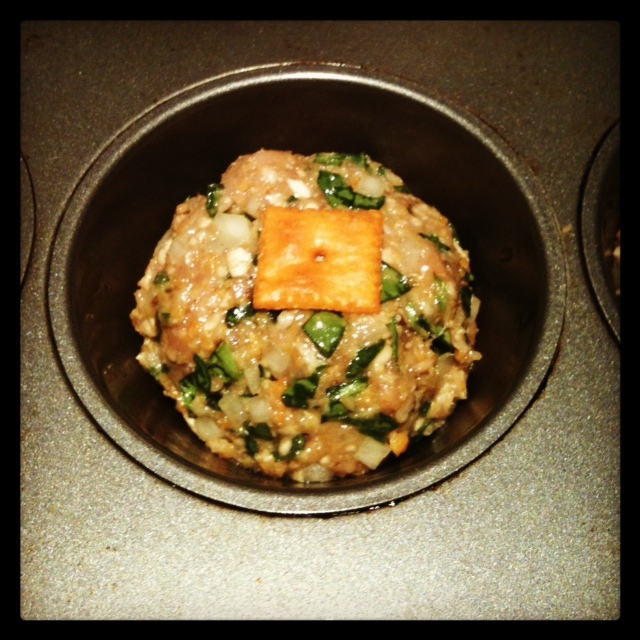 I also minced spinach to add some veggie nutrition to the mix. I love making these meatloaves. They are easy to make when time is tight. The ingredients are easily interchangeable. And, it’s fun to have a little personal meatloaf (or two…or three…) sitting on your plate. Without any further babbling on my part, let’s get started. I hope you enjoy this incarnation and are inspired to create your own! Preheat your oven to 400 degrees. Pour a small amount of olive oil into each cup of a muffin pan and spread the oil to coat the inside of each cup. While your oven is preheating, chop/mince all of your ingredients. Next, combine all of the ingredients in a large mixing bowl and gently work them together with your hands. You don’t want to overwork it, but you want all the goodies evenly distributed in the meat. 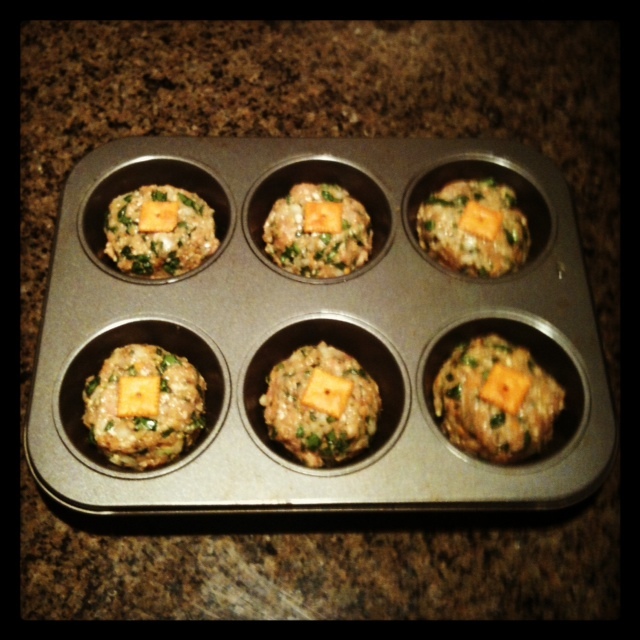 Loosely form the meat mixture into balls that will fit in your muffin tin. Place each ball into the muffin cups and lightly press down. They will take the shape of the cup as they roast, so you do not need to firmly press them into the tin. Top each muffin with an extra cheese cracker. Or, a little sprinkle of grated cheese would work nicely as well. So far, I’ve used the phrase “cheese cracker” quite a bit. As stated before, I’m not really out to advertise for any particular brand…but if your cheese cracker of choice doesn’t rhyme with “wee zit” I would have to say you have chosen poorly. Cheese cracker, ready for its close-up! Place the muffin tin in your preheated oven and bake for about 30 minutes. While the meatloaves are roasting, you’ll have plenty of time to prepare some veggies or the side of your choice. 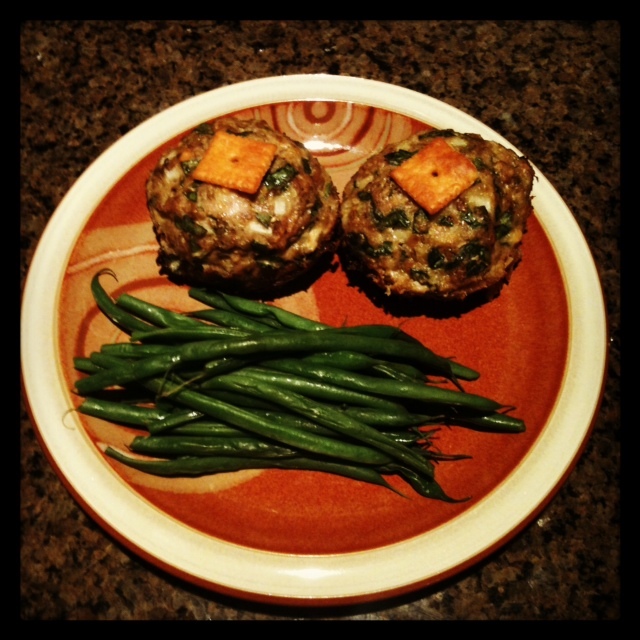 I served mine with some steamed fresh green beans as a nice simple balance to the meatloaf muffins. Does it look like a face? A little. Does it taste good? A whole lot! As this is the third installment of these muffins, I think it’s clear that the possibilities are vast within the framework of this simple recipe. If you find a combination of flavors you love, please leave a comment and let me know what you tried. And, as always, Enjoy!